Annette Swisher, from left, speaks while Ann Rea Miller, Lisa Niekamp-Urwin, Julianne Frankhouser and Jacquelyn Beckner look on during a panel discussion Thursday during a Women In Business meeting. The women discussed issues central to women in business careers. 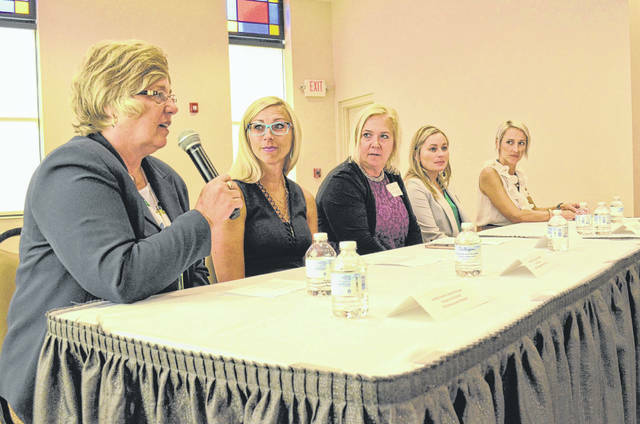 LIMA — A panel of five area business women, each having been finalists or won area business awards, spoke to other area business women on time management and productivity during a Women In Business meeting Thursday. The panelists included Ann Rea Miller, optometrist and owner of Visual Eyes Inc. and winner of the 2018 Emerging Business of the Year award; Lisa Niekamp-Urwin, president and CEO of Tomorrow’s Technology Today; and 2018 Woman-Owned Business of the Year Finalist Annette Swisher, general manager of Wingate by Wyndham, and recipient of the 2018 Athena Award; Jacquelyn Beckner, director of marketing at Ohio State University-Lima; and 2018 Young Leaders Award Finalist and Julianne Frankhouser, director of Guiding Light Ministries and 2018 Athena Award Finalist. WLIO co-anchor Jessica Gavin asked panelists questions on different topics. The first question presented to the panelists was about effective time management. Frankhouser said focusing on what needs to be completed during each moment or each day instead of being distracted by projects for another day helps her manage time effectively. Another question presented to the panelists had to do with balancing personal life with professional life. Each of the women agreed this all depends on each individual. Each one of them has different practices for balancing their lives. Miller said she works four days a week and takes the fifth day of the work week to spend time with her children. Swisher said she finds balance in her own life easier to maintain by helping her employees balance their professional and personal lives. When asked how to work smarter instead of harder, Becker said she suggests using timers. If you know how long projects normally take, you can set a timer and it will help you complete projects in the time you’re allotted. She said this works for her. If the project isn’t completed, examine why and what caused the distraction and remedy it, she said. Swisher ended the panel by reminding the women in attendance to remember to always take an hour a day as time for themselves.